Willie G. Moseley, senior writer for Vintage Guitar Magazine, has recently written an excellent history of Peavey guitars. 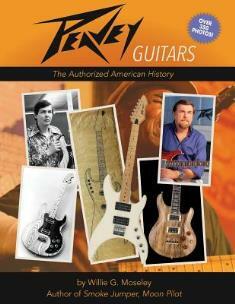 In Peavey Guitars: The Authorized American History, Moseley presents guitar aficionados with a detailed study of the evolution of the Peavey Electronics Corporation, focusing primarily on the company’s line of guitars and bass instruments. With a background working in his father’s music store in Meridian, Mississippi, in the 1950s (his father did not like electric guitars, instead preferring acoustic instruments) and playing guitar in local combos, Hartley Peavey began his company with an $8,000 loan from his dad after graduating from Mississippi State with a business degree in 1965. Peavey earlier attended Ross Collins Vocational School before entering seventh grade, receiving an age-waiver because his great-uncle—the fellow who invented hydraulic lifts for automobiles though failing to get it patented, thus missing out on a fortune—was an instructor. The kid studied mechanical drawing, radio repair, and how to operate milling machines and lathes. Peavey had been building guitar amplifiers in his parents’ basement since he’d been a teen, constructing amps for friends in exchange for guitar lessons. So guitar amps were the company’s first products. But he soon learned that affordable sound systems for bands to sing through were more viable. “A dealer in Montgomery told me something like, ‘Son, I’m not interested in your amplifiers but if you had a sound system, I’d be very interested in that,” Hartley remembered. “On the drive back to Meridian, I got to thinking: ‘I can do that,’ so I designed a four-channel, 100-watt sound system. This was around 1967 or ’68, and about the only two sound systems you could buy back then were the Shure Vocal Master…. It cost a thousand dollars. Kustom also had a four-channel system for about nine hundred bucks. Remember, this was back when gas was 32 cents a gallon…. I had paid enough attention to my father’s pricing at retail, so not knowing any better, I priced my stuff at about a 30 percent gross margin over cost, hoping to end up with ten percent net.” Peavey sold his sound system units for $599 apiece and couldn’t build them fast enough. Perhaps the greatest innovation of Peavey guitars was that they were the first to be built by machines for mass production. Guitar giants Fender and Gibson were still using handwork for each instrument built. Peavey visited those companies’ guitar plants. “God, what an archaic situation that was,” he recalled. “I could tell that the way they were making guitars was primitive.” Peavey recognized there was a faster method, but he needed a guitar-construction genius to implement his idea. Thus, Chip Todd enters the Peavey guitar story. Todd was a Texas guitar-constructor who held numerous patents that had nothing to do with guitars. He was a mechanical genius who raced and built his own cars, and once worked for a funeral home when mortuaries still had ambulances. Funeral home ambulance drivers like Todd would make bets among themselves on which driver could reach a wreck first. In the end, it was a mutual love of firearms that no doubt helped finalize the decision to hire Todd. Hartley Peavey would be as impressed by Todd’s ability as a gunsmith as his ability to create a guitar. He and Peavey figured out how to build guitar necks using a machine that carved gunstocks. He was the only employee in Peavey’s guitar division of manufacturing the first year the company made musical instruments. There’s enough history to interest even a guitar novice like myself. Most of the book, however, will more likely interest true gear heads and genuine six-string aficionados. Each Peavey design the author covers offers in-depth analysis and description about how such guitars are built, including what differentiates one from another. Willie G. Moseley leaves no ground uncovered. The electronics genius and businessman would go on to hang out with presidents. During President George H. W. Bush’s campaign for re-election in 1991, Bush visited one of Peavey’s nineteen factories while campaigning. Hartley Peavey had his company create a red, white, and blue acoustic guitar with a stars and stripes scheme that was given to the President. A year later, President Bush invited Peavey and his wife to the White House to present him with a National Literacy Honors Award in recognition of Peavey Electronics Corporation’s commitment to furthering the education of its employees. Ed Reynolds is a writer in Birmingham, AL.